But just as Sloan is settling in to her new gig, she finds one of Nitro’s competitors dead in the fermenting tub, clutching the secret recipe for the IPA. When Mac is arrested, Sloan knows that her ex might be a cheater, but a murderer? No way. Danger is brewing in Beervaria and suddenly Sloan is on the case. I've read some of Alexander's Bakeshop Mystery books and enjoyed them so when I saw this one I decided to read it. I love getting in at the start of a new series. Both series are in small towns (different ones) in the Pacific Northwest and I enjoy both settings. 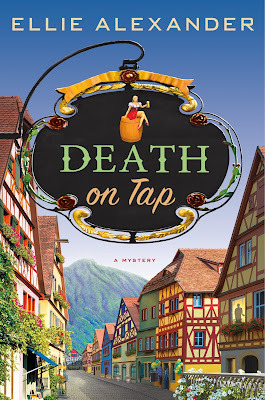 In "Death on Tap" the setting is a town that has an interesting niche - they appeal to lovers of German culture, specifically Bavarian culture. Shops and businesses are designed with tourists in mind and follow the German/Bavarian theme. When the town celebrates Oktoberfest, it begins in September and goes until November. The town is particularly known for its breweries and pubs. The town is overflowing with microbreweries and nanobreweries. Sloan, our heroine, married young and was happy to be a wife and mother, and to help with the family brewery and pub. She grew up in foster care and has glommed onto her husband's family as her own. She loves them deeply. When her husband moves out after she catches him screwing around, she worries extensively that she'll lose her in-laws and blames her husband for it, even though it hasn't happened and may not happen at all. She's needy when it comes to family, and it got annoying listening to her constantly blame Mac for costing her her relationship with his family when, in fact, no such thing has happened. I wanted to smack her on multiple occasions. I had to remind myself that she was hurting from discovering her husband's infidelity and not thinking rationally. Sloan, with the blessing of her in-laws, who are also her bosses, leaves to work at another brewery and pub that has just opened up. The owner has no clue what he's when it comes to running a pub and only some idea at managing a brewery. He and Sloan hit it off and work well together but at the pub's opening there's a scene followed hours later by a murder. Worried about her new job, Sloan asks around, trying to figure who might have wanted to kill the victim. Then her husband is arrested and for their son's sake, and because she doesn't truly believe Mac did it, she tries to clear his name (even though a part of her would have been happy to let him sit in jail). I guessed who the killer was though not why. When it was revealed why, I was kicking myself because the clues were there. Alexander did have a surprise in store however concerning the investigation that I did not see coming. But again, when I looked back, there were subtle hints. Kudos to the author! Additionally, the author either has experience brewing beer or did extensive research. The book is steeped in the brewing world, a little too much so. It seemed at times as if she was so excited to share her knowledge that she forgot about the story and yet the details of brewing were essential to the mystery. Perhaps it will balance out more in the next series now that she's done the info dump in this book. There was also a surprise concerning the Krause family brewery that sets up all sorts of potential conflict in future stories. I felt the incident near the end with Mac's mother was unnecessary and sad to say, I did spot that a mile off. While it contributes to the future conflicts, it was unnecessary and cliched. I enjoyed "Death on Tap". The brewing and pub industries and the tourist culture were fascinating and I loved the townspeople and their eagerness to help one another. Sloan could be annoying, mac was immature and selfish, and Garrett was a but of a mystery man. Mac's family was sweet as could be and I liked them tremendously. "Death on Tap" has a fantastic cast of characters and an intriguing setting. I'm looking forward to more stories. I really enjoy Alexander's bakery series and have been wondering about this one. There does seem to be some annoying behavior on the part of the characters - especially Sloan - but hopefully that'll get better in the next books. Glad you enjoyed it! I liked Sloan but she could be annoying. Still, I liked her for the most part and the setup for the series is interesting.